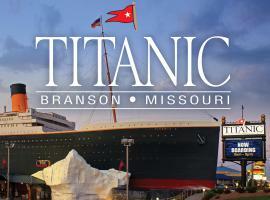 If you are looking for an attraction that the entire family will enjoy, check out the Titanic Museum! You will find this amazing ship right in the middle of Branson! Upon arriving, you will be given a boarding pass with facts about an actual person that was a passenger onboard the Titanic. After, you will be escorted into the museum where you will be able to touch a growing iceberg. As you walk through the museum, you will be able to view over 400 real artifacts. From videos to audios and pictures, facts about the Titanic are everywhere! Guests will also love the interactive exhibits in the museum! You can play the Titanic Baby Grand Piano or stick your hand in water that is 28 degrees. That is the exact temperature the water was when the Titanic sank. As you exit the museum, you will walk down the magnificent Grand Staircase! Be sure to stop and get your photo taken there, as it is a great experience! The Titanic Museum is an attraction that you will never forget!